Below are a list of some of the main substrates available currently and my experiences of there use, it's worth bearing in mind that the right substrate for you may be different to me as preferences vary widley. This is a substrate from the horse world, it uses recycled cardboard either shredded into soft strips or cut to form small cardboard squares. It is virtually dust free and ideal for rats suffering from respiratory problems. It is also much loved by nest building girls as they can often be seen carrying squares around to there beds. It’s downside is it’s absorbency can be worse than other substrates which can lead to it becoming smellier quicker (though it is not as bad as newspaper or hay/straw) but as a bonus it is very rarely kicked out and when this does happen is very easy to clean up. Cardboard square are also generally very cheap (in the region of £5-£10 for a big bale) but can be difficult to source. Shredded cardboard has the benefit of being softer and more absorbent than cardboard squares but it also generally cost more at £10-£15 for a similar sized bale but it still offers great value. Shredded is also particularly good for scatter feeding as it digs well and smaller pieces fall easily into the gaps. There are 3 main brands for cardboard substrate; EcoBed (cardboard squares), Finacard (shredded cardboard) and Greenmile (also shredded cardboard). This substrate was the most commonly used floor covering for many years and was widely accepted as the best choice given that they are highly absorbent and normally very reasonably priced. In fact even now rat books are being produced recommending it, however recently research has come to light suggesting that in fact this might not be the best thing for our furry friends. The problem is that Pine and other soft woods (red cedar being the worst) contain lots of phenols which give it that pleasant ‘Pine’ scent. The phenols are a kind of acid which when inhaled may attack the respiratory tract and damage it. They may also be an added stress on the body and in particular the liver which can lead to liver damage. These phenols have been suspected of irritating ratty lungs for years and so a lot of research was dug up to investigate and quickly many people moved to a safer option. A study carried out on rat kittens (babies) found that of those birthed on cedar shavings (one of the highest phenol content shavings – higher than the more usual pine shavings) 56% were dead in 2 weeks compared to only 0.01% on other safe beddings. But there are also studies suggesting it is relatively safe depending on the type of soft wood used. One thing to note is that in the UK most wood shavings are Spruce or pine; this is a better option than cedar, which is common in the US, but still a soft wood. They are also generally dust extracted and in some cases heated to remove most of the phenols. This being the case UK wood shavings, though still questionable, are not necessarily as dangerous as some Cedar based reports suggest. As with anything it is up to you to make a call on the risks and decide what you prefer to use. In most cases healthy rats with strong respiratory systems do not appear to suffer from being kept on wood shavings, but it can trigger respiratory problems in those rats with weak immune systems or from a poor background. Given the variety of other options available most rat owners opt for one of those beddings considered safer. If you are tempted to go with wood shavings there are several things to look out for that will help minimise any risks. 1, Go for dust extracted bedding only, to check try fluffing/mixing the litter up, if lots of dust comes out then this is to dusty, a little dust is expected in nearly all beddings. 2, Look for heat treated litter, this removes many of the phenols in the wood, heat treated shavings generally smell lightly of wood rather than pine fresh. 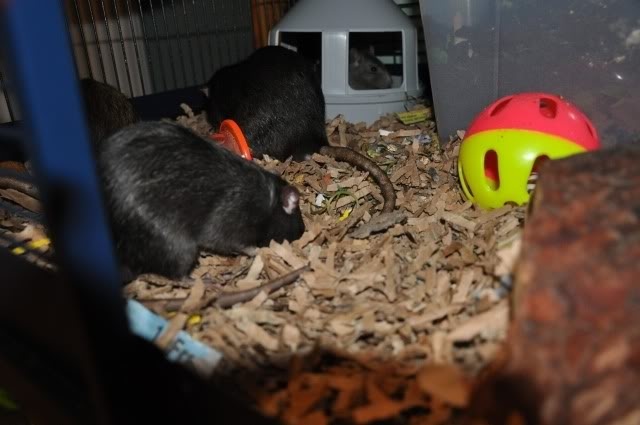 Try confining the litter in a small space/box, stick your head in and inhale (not a good idea if you have asthma or allergies), does it make you sneeze or tickle your throat; if so the dust/smell will be too high for your rats. 3, Never go for litters with added scent, this is just added phenols and will just increases the risk. 4, Avoid using shavings for young kittens or rats with poor immune systems, a history of respiratory problems or from an unknown background (rescue rats or pet shops sourcing there rats from ‘rat farms’). It is well worth shopping for better quality brands, especially those sold for horses, who also have a sensitive respiratory system. These often also work out cheaper as you buy in bulk. 1 horse sized bale typically lasting 3 months for a single medium sized cage. I personally rate bedmax or hunters which is a heat treated dust extracted soft wood shaving sold for horses. Hay and straw were considered good substrate for small animals but in reality are generally quite dusty and poorly absorbent. Whist it might be nice to put a handful of hay in for your rats to bed down on or eat, a cage entirely filled with it could become smelly quite quickly. There has also been reported occasions where rats, especially kittens have been injured by sharp pieces of hay or straw stalks or have become tangled in longer stalks, though this is very rare. Hay also makes a nice ‘topper’ for a more absorbent substrate, whilst most rats don’t find it very edible they like moving it around and digging in it. It is also nice and insulating as a nesting material in cold weather. On its own it is generally not a good idea and needs to be changed regularly. ﻿This is a very poor choice for using with rats and most small animals. It is basically soft wood dust and therefore carries the risk of phenols in much the same way as wood shavings however it is much rarer to find it heat treated or dust extracted. Due to the nature of sawdust it contains many small particles and so is generally dusty and can irritate a rats sensitive respiratory system and will also be easily kicked out and spread. It is quite good for digging in and is fairly absorbent though but there are many alternatives which are better for your rats. The two main commercially available brands in the UK (Hemcore and Aubiose) with Aubiose being the favoured brand due to it being both softer and more pleasant smelling. It is a very absorbent litter and pleasant to look at, it is also good for digging and quite low in dust. It unfortunately is very light and fine which results in it being very easily kicked out of the cage and has a habit of ending up in the most unusual places, however it’s benefits generally outweigh the downside as it is one of the best beddings for keeping smell down and also one of the cheapest if you can find a supplier (around £7.50 per big bale). Aspen litter looks remarkably like Auboise hemp bedding and has similar properties though with less natural scent. It provides a good alternative to hemp and wood shavings though again shares hemps downsides being lightweight and easy to kick out though is often easier to get hold of. Other hardwood substrates are often sold as reptile substrate such as bark chips. These can be a good absorbent bedding but are often relatively expensive and can be tricky to get hold of in reasonable volumes. This offers a good absorbent and dust free floor covering though care should be taken with some towels as ratty toes can be caught in those with fibre loops. It is reusable needing only to be shaken and brushed down then put in the wash, though it will become chewed over time (towels seem to be chewed more than fleece). It’s main downside is that it does not offer a good digging opportunity for the rats and really doesn’t suit scatter feeding. There’s also the challenge of getting the rats to keep it covering the floor rather than in an exciting pile in their nest. Velcro can be used either on the corners or more effectively all the way along the edges (the corners are often the first to be chewed off) but the rats will often opt for sleeping under the towels/fleece whatever you try. Still it offers an option when coupled with a more usual litter in the litter trays and is particularly good for elderly rats who struggle to get around. If you use it though it is well worth offering deep trays or a more diggable substrate or a digging box to let them exercise their natural instincts. Paper cat litter such as Biocatolet, Paperlit and Yesterdays News are well used by many owners. They are safe for rats to eat (which they will do with pretty much all bedding) and are highly absorbent so keep the smell down. 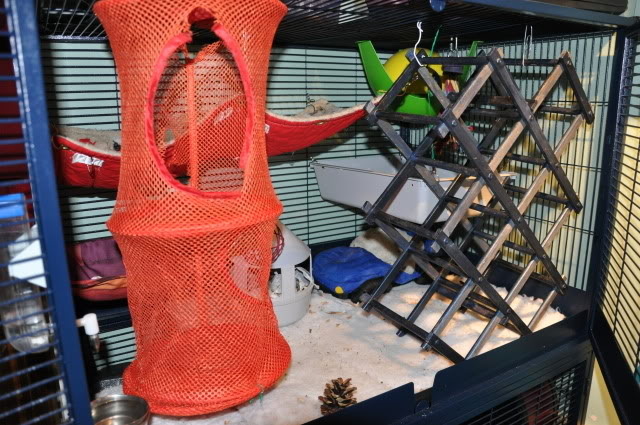 Unfortunately they do work out expensive for large or multiple cages but an answer to this is to use them in a litter tray with another substrate covering the main floor. These brands can be bought from most pet shops and are becoming increasingly available in supermarkets but care should be taken to get only those containing 100% recycled paper as often unbranded paper based cat litter contains residue from the paper making industry complete with many unpleasant chemicals. While this isn’t a problem for cats who merely use it as a toilet it isn’t good for rats who like to eat there bedding too. This is now the main product used for small animals in many big pet shops. Whilst it is generally considered better than sawdust it has many downsides. In it’s basic form it is a hard pellet which is not the most pleasant thing for your pet to walk on though it is fortunately fine for them to eat if they so desire. Unfortunately upon exposure to liquid it quickly breaks down into a wood powder which is how the litter holds in its smells. When this dries it basically becomes sawdust and has all the associated problems. Ideally this litter should be avoided despite its good absorbency or it should be twinned with another litter covering it to prevent particles flying around irritating the rats respiratory system. This should never be used with small animals, not only is it usually highly dusty but it can also be fatal if your rat (or other small animal) eats too much of it. Being clay when eaten it can form a blockage in the stomach or intestines which can harden and become immovable without surgery. This litter is pleasant smelling though a little hard on an animals feet. It is highly absorbent but has been rumoured to cause problems in small kittens. Due to it’s absorbency it can absorb the water in the atmosphere, particularly just above the surface of the litter. 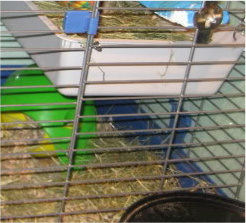 This reduces the humidity to below what a rat needs and particularly in small and growing rats can cause a condition known as ring tail where a section of the tail stops growing and hardens restricting the tails blood supply and sometimes leading to amputation. However it is a viable option for older rats and is also safe for them to eat. This is a cheap or even free option for a substrate however it has poor absorbency at best and can quickly become smelly. 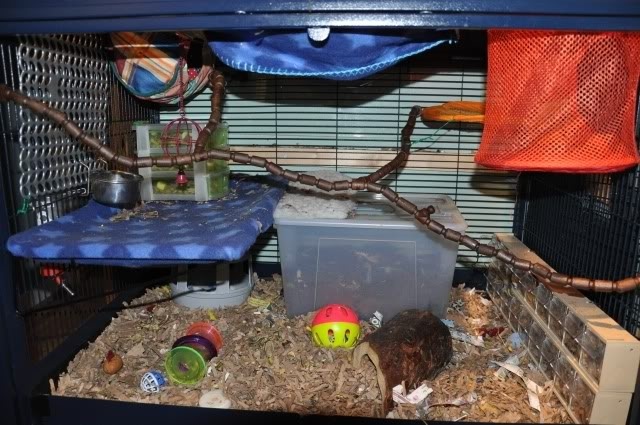 It can work where a rat is litter trained and has an alternative substrate in the litter tray but in general is better used for the rats to shred and turn into nests then as a floor covering. Most shredded paper (e.g. from your home office) is fine to use for rat bedding. Paper that has been printed on with toxic ink should be avoided as rats will attempt to eat most bedding. Shredders that cut longer strips of paper are more suitable as shorter (or cross cut) shreds are very fly away and aren’t as good for building extravagant nests. Shredded paper can also be quite dusty (a by product of the cutting process) so it may be worth avoiding for rats with known respiratory problems. Shredded paper is also pretty poor in absorbency which can lead to smelly rats. These are products a little like shredded paper, however they offer far better absorbency and are comparable with Card in keeping the smell down. Sold for small animals and occasionally for larger animals such as dogs the typically come in at £20-25 for a large bale so are not cheap. They are far more likely to be used as a nesting material or for rearing kittens on. As there is no universally perfect litter the best results can often be had from combining two different combinations. One method is to use one to cover the floor and one in the litter tray (this can help encourage litter training). The other method is to mix to substrates together to maximise there good points and minimise the bad. An example of this is to use hemp (ultra absorbent but easily kicked out) mixed with shredded cardboard (less absorbent but much less messy). The hemp will settle on the bottom providing an absorbent layer whilst the larger cardboard provides a top layer which keeps the hemp from being kicked out easily. Another popular combination is to combine an expensive litter such as biocatolet with inexpensive ‘fillers’ such as cardboard squares or shavings to bulk it out.